Physical Examination: This patient exhibits a Norwood 6 pattern. There is only very scant miniaturized hair in the midscalp area. He has a healthy scalp and has excellent elasticity in the donor area. Also, his density is very high, measuring 120 follicular units (FU)/cm2 in the posterior donor and 94 FU/cm2 in the lateral donor areas. The donor hair contains a high percentage of 2- and 3-haired grafts, straight, of average caliber, and dark brown in color. Plan: The plan for this patient is to harvest as many grafts as possible. The goal is to cover the frontal and midscalp zones with high density and to cover the anterior part of the vertex zone with as many as grafts allow. Because of the patient’s severe hair loss and limited donor, we need to be conservative in the use of grafts. We will restore a natural framing of the face with a conservative hairline that is not too low or aggressive. Also we do not want to dedicate too many valuable grafts to the back of the scalp. Procedure: A linear strip harvest (FUT) was performed. There was excellent elasticity, and a strip of 25.5cm x 1.5cm was removed. Grafts contain 1,2,3, or 4 hairs. We obtained 752 singles, 2515 doubles, 856 triples, and 83 quadruples for a total of 4196 grafts. The grafts were stored in a chilled HypoThermosol solution with liposomal ATP prior to transplantation. Around 500 single grafts were placed in the hairline zone in a natural and irregular pattern. In the center of the bald scalp we allocated all of the triple and quadruple grafts. For the rest of the scalp we used 2-hair grafts. The patient was sent home with postoperative instructions and was advised on the use of liposomal ATP every half hour for the first 48 hours along with daily hair washings. 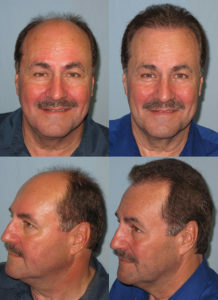 Results: The photos show the patient before and after 12 months. The patient has excellent coverage thanks to the large session that was able to be performed.